Color film was not available in 1909, and of course we cannot know what colors these folks were wearing, but it would seem that at least a few were wearing something besides black or white. There is a modernism that tends to devalue heritage; we have a tendency to think that the ways of our parents are outdated. Every generation seems to invent behaviors purposely different than those of their predecessors, yet most of us eventually learn to value our roots. Only in our heritage do we find that solid foundation of truth that has stood the test of time. We cannot avoid seeing around us the price that is paid when this foundation is ridiculed as being “old fashioned.” “It’s no fun; it’s not relevant;” and it interferes with what I like to do.” It’s remarkable that every single generation since Adam encounters this “brilliant” evaluation of its heritage. Yet it fails every time. So study this old photograph. These people, in the ways that matter most, were just like us. As they stood together in the sunshine of that beautiful March afternoon, they certainly were thinking about the future. May we think of them as they really were, not in black and white, but in full color just like us. Most of all, let us desire to imitate their love of Christ so that we may exemplify Jesus in our time as they did in theirs. Banks, Oregon is in big timber country where Douglas Firs still can reach more than 200 feet toward heaven at harvest time. At the turn of the century (1900) a railroad was planned to extend from Hillsboro to Tillamook. This news inspired Montgomery Turner and his brother Ewell to open a general store here in 1901. The town might have been named “Turner,” but there was already a Turner, Oregon near Salem. So the town was named after John Banks who owned land here. The first Banks Post Office was inside the Turner Store. So it was that the town of Banks sprang up in the area where the railroad would begin its long, twisting route over the Coast Range. The production of lumber became the major industry here and remains very significant to this day. When the town began to bulge with lumberjacks coming to work in the woods, things got wild at times. The need for a church was evident, so a group of concerned citizens started having services in a small log cabin which had been used as a school. When the cabin could no longer contain them, the worshipers moved into the IOOF Hall. To provide leadership for this new church, the Oregon Conference of the Methodist Episcopal Church, assigned Reverend C.L. Creesy as it’s first pastor. Then, asking a formal consideration of two dollars, John Banks, the town’s namesake donated the parcel of land on which the church was to be built. It was at a Quarterly Conference meeting in nearby Cornelius, Oregon, that a building committee was established. It’s members were Charles A. Shipley, N.C.Shipley and E.F. Willis. As the building took shape, railroad tracks were being laid at the east end of the block here on Depot Street. 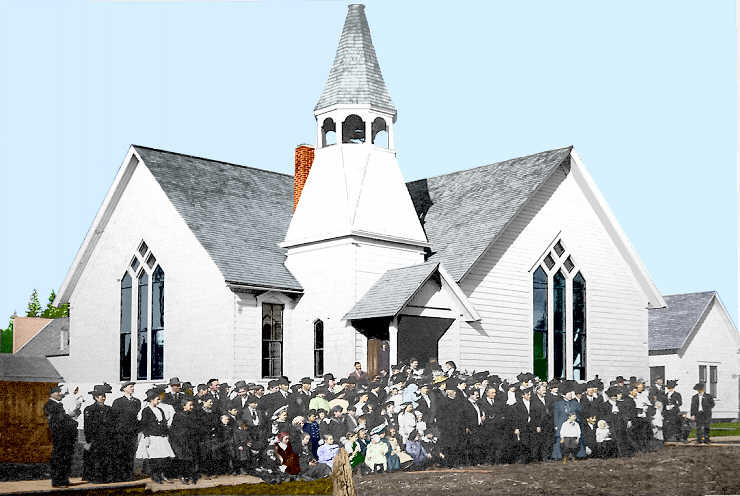 On that beautiful Sunday, March 21, 1909, the church dedication was an all day celebration attended by a total of about 300 people from around the area. After a magnificent lunch at the I.O.O.F lodge, about 100 people gathered in front of the church to be photographed for posterity. That’s us! The day after the dedication of the Banks Church building, a real revival was started. Pastor W. Clyde Stewart covered the youth with his love. He attracted them to Christ by playing baseball and basketball with them. Here you see him humbled among them in the lower center of this photograph. In addition to Sunday School and Morning Worship, Pastor Stewart preached at the nearby communities of Roy or Fir Grove each Sunday afternoon. At 6:30 P.M. he was back in Banks for the Epworth League, then preaching at 7:30 P.M.
Banks, Oregon has remained a very small town. For most of this time, it’s population has been approximately 500, but residents of the surrounding area have been connected to Banks by the small stores, the schools and our church. This church represents the community and its history.